Fascism is always lying there, just under the skin of democracy, waiting for its place in the sun. For openers, the National Alliance in Spain declares itself the ideological heir of European fascism, the Golden Dawn in Greece is described as neo-Nazi and fascist, along with Italy’s New Order Vanguard, a neo-fascist group. Elsewhere across Europe right-wing conservatism is on the rise, fueled by economic stagnation, joblessness, immigration fears as Africa continues its stream of boat-people across the Mediterranean to the shores of Italy, Spain and Greece. France, Sweden, Norway and the United Kingdom are feeling the pressure of increasingly right-wing organizations simmering on the stove of populations that see themselves as increasingly abandoned and disenfranchised. All of which may or may not be true and may or may not be a fair assessment—but the fear is there over the future of Europe’s great experiment with union—and fear has always been the soil in which fascism takes root. 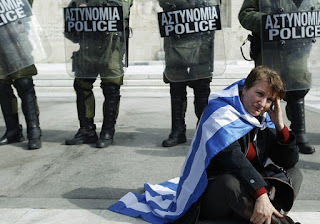 So what the hell is going on in Greece and why is that important? Greece is having forced upon it an austerity program, no matter that the country refused this ‘offer’ by a 60% majority in a national referendum. So the Greek prime minister went to the EU with referendum in his hand and was made a new offer—more and deeper austerity and a three-day window within which to accept it. With no other choice, he signed and went home to face an enflamed legislature. As I write this, the story unfolds. But why this severe punishment? The answer seems to be because they can. Golden Dawn must be rubbing their hands and we have yet to witness the streets of Athens in chaos and destruction. Angela Merkel and Germany are the architects of the scaffold upon which Greece stands and Wolfgang Schauble (former German Federal Minister of Finance) is the executioner. One might expect a bit of German history to be relevant here, but then maybe not. First example is the 1918 armistice, under which Germany was so crushed and humiliated by allied demands that the stage was set for the rise of the Third Reich under Hitler. Austerity didn’t go down all that well in a defeated Germany. A second example is Greek claims for WWII reparations from Germany amounting to €278.7 billion. In May of this year the German president, Joachim Gauck, announced it's the right thing to do “for a history-conscious country like ours to consider what possibilities there might be for reparations.” Earlier, the president declared he understood the calls for WWII reparations, saying that Berlin should examine its historical responsibility to Greece. The third (and perhaps most telling) example is America’s Marshall Plan lifeline to a defeated Germany, a country smoking in rubble and economically devastated. Repayment of Marshall Plan loans were not based upon austerity, but rather a stretched-out process linked to German prosperity. In fact, in addition to Marshal Plan funding, another 32 billion deutschmarks were owed to government and private banks in the U.S., France and Britain. Under the London Debts Agreement of 1953, the repayable amount was reduced by 50% and stretched out over 30 years. Germany can hardly claim to be the victim of austerity under those circumstances, but Merkel and Schauble care little for history. That was then and this is now. Which brings us to the (perhaps) fatal flaw of the euro. There is no financial federation among the nations of the European Union—merely a common currency. When economic problems arise in Europe, there is no mechanism with which to deal with them. Germany is terrified of precedent. What happens to the weaker nations such as Italy, Spain and Portugal if they lend a helping hand? Good question. There are many possibilities, but austerity is not among them. The US is a federation of its 50 states. All Americans pay a federal income tax, unlike within the EU. That money goes to Washington and is re-allocated according to need. California is rich, so it gets back less than it contributes. Mississippi is poor, so it gets back more than it pays and so it goes across the fifty states. So how do the states themselves survive? By various methods—some have their own income tax, often combined with property taxes—others have what amounts to a VAT and all survive by tax combinations decided by their state legislatures. Europe has no such economic federation in place and thus makes its nation-states hostage to the euro. Hostage? Yes, if there is no redistribution mechanism, you become a hostage without a chance of autonomy. Some EU countries (such as the Czech Republic, where I live) have hung on to their currency. If Greece had made a similar decision (as well as Spain, Portugal and Italy), they would be able to work their way out of trouble internally, without having a brutal austerity program forced upon them. Greece has few options and all of them are difficult. Essentially, they cannot leave the euro because reclaiming the drachma takes time and they have no time. 19 of the 28 EU states currently use the euro and all but 3 are obligated to use it at some future date. Those three must be breathing a sigh of relief. So we will soon see where the future of Greece lies, but this is serious stuff and not only for Greece. Making the choice between investors and member nations, Germany has chosen to make well Goldman Sachs and the banking community over the dying body of the Greek nation. Angela Merkel said that the deal was reached despite the recent loss of "the most valuable currency, namely trust in each other." It’s unclear whether she meant trust between Greece and the Eu or the much more dangerous trust between the weak and strong states of the Union. At any rate, the seed-bed has been cultivated, fertilized, raked smooth and elegantly prepared for the seeds of fascism to flourish.